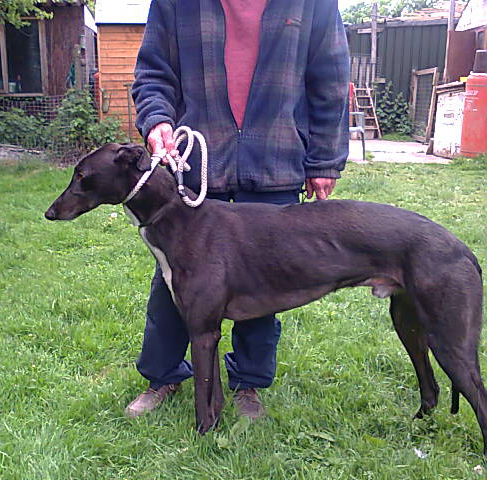 Joe arrived on Monday 8th July 2013. Joe was born in february 2010 and is a large handsome black ex-racing greyhound, weighing in the region of 37k he measures 29" to his shoulder and 39" to the top of his head. 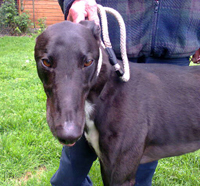 Joe is microchipped, and since his arrival here he has been neutered and his inoculations brought up to date. Joe is a lovely dog, is okay with other breeds of dogs, walks nicely on the lead and travels well in the car. 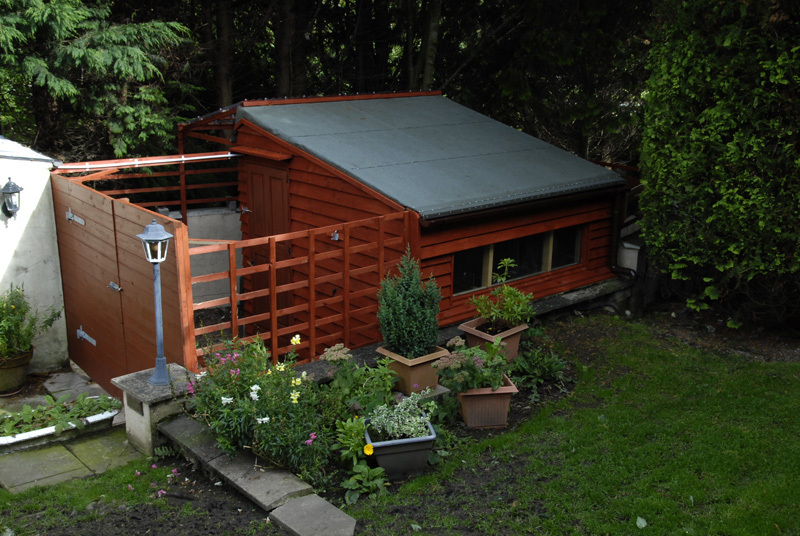 * The branch kennel at the bottom of our garden is where Joe and the other resident(s) will be for the first day or so until he gets to know the other greyhounds. He has use of our garden and paddock, and once he gets to know the other dogs he will be allowed in the house during the day and all the dogs will then take it in turn to sleep in the house at night, so they become use to sleeping in both the kennel and the house. Well Joe never ate any of his food last night and I found his dish on the dog bed in the end kennel section with his food all over the bed and kennel floor. Oh well, at least the food had soaked up the liquid so it was pretty easy to clean everything up. Joe never wanted any food again this morning, but we had been warned by his previous owner to expect this for a day or two because he's been known to do it before. Joe took a trip to the vet today to have his first inoculation because he came with no card, and to be neutered. He weighed in at 35.4k. While in the waiting room he said hello to a number of spaniels and a terrier was walking around his back legs - he just looke to see what it was then ignored it. With his behaviour towards the spaniels and the terrier Stuart says he is 'rock solid' with other dogs. This morning Joe was up and about, obviously recovered from his anaesthetic and joining in with all the other dogs. Joe has really settled in well and he's a joy to have around. He's taken to living in a home like 'a duck to water' and to say we've only had him a few days, we don't even know we have him half the time. He's such a lovely boy, but then the very big ones often are! Well, this morning Joe was waiting for his food along with the others when I turned my back to get something I caught him in the process of helping himself to one of the dishes of food from the work surface. All done so gently, and he never bothered when I took it from him saying 'not quite ready yet'. With him being as tall as Solo he only needs to lift his head up a little and he can see everything on the work surfaces. This morning Joe went to the vet for his second inocuation and have his neutering stitches removed. 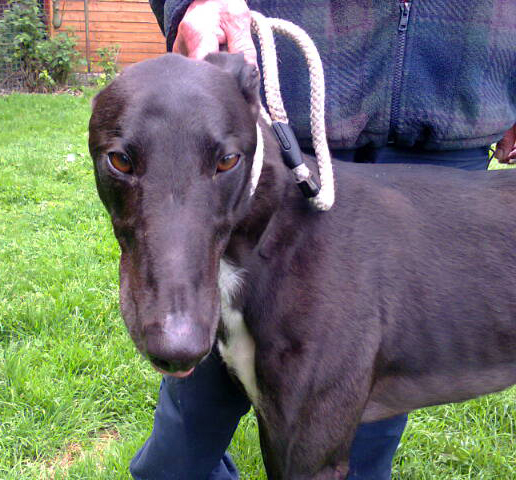 This afternoon Joe's new owners called here to adopt Joe and take him home with them to live with three other greyhounds. Joe remembered them from when they called to visit him earlier, and when they reserved him prior to being neutered and his inoculations being brought up to date. We are sure Joe will have a long and happy life with his new family, and hopefully we may see him again when they next visit this area. We received an email this evening letting know that Joe's new owner's dogs welcomed him in to the house after a little stroll. He had the grand tour of the house then fell asleep in front of the TV. It's a bit late but they have just fed them all and Joe had a few mouthfuls. 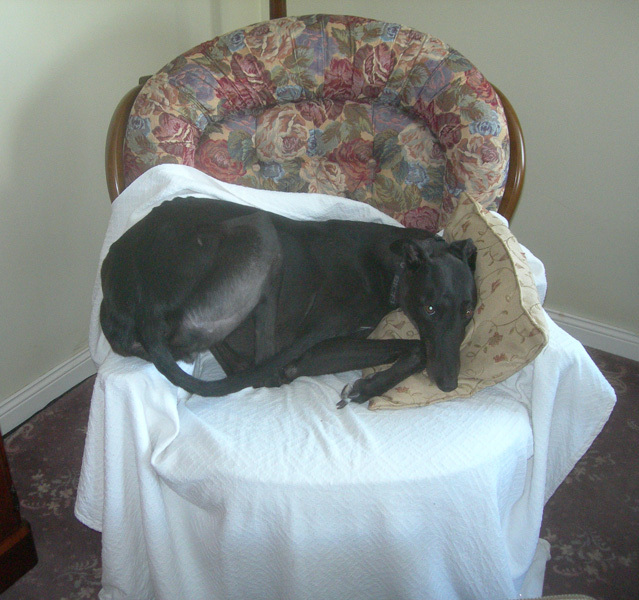 He is now crashed out in the bedroom on a dog bed, Kelly, one of their other greyhounds keeps going to put her nose on him then walks back to her bed. 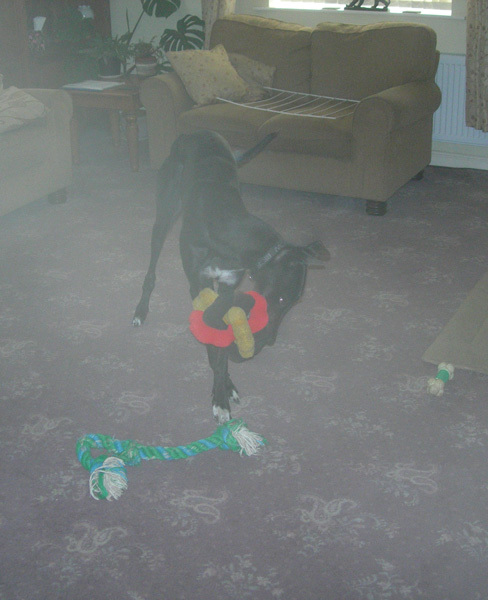 We received some photos today of Joe in his new home with a message saying Joe settled in straight away. 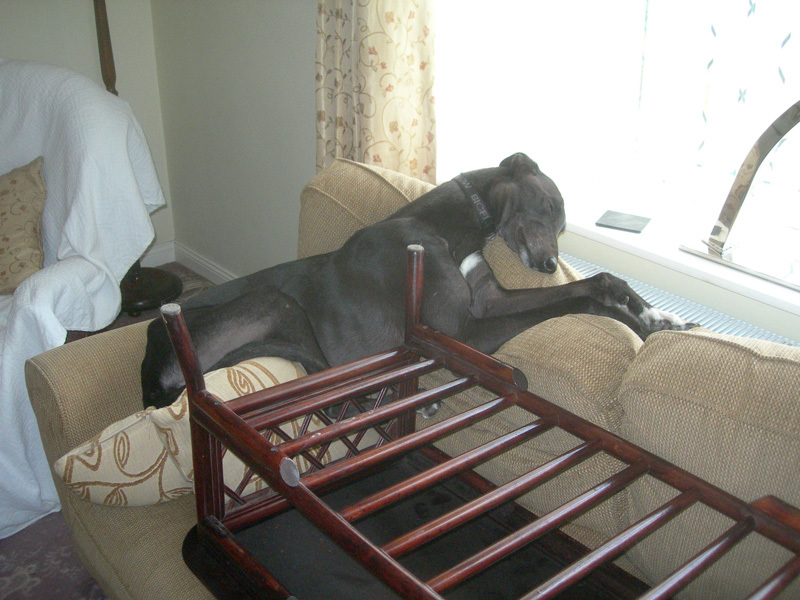 How such a large dog can get into such small spaces is amazing! 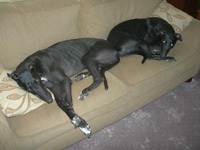 He is firm friends with all the dogs, and Kelly, who is black, is his shaddow, she really goes soppy over him. Joe has a loud bark which comes into effect each morning when Rebal, the Labrador arrives for the day as Joe winds everyone up to play.Trouble is he likes to stand on the settee as he barks, so goodness knows what the neighbours think as they see this large dog bouncing up and down in front of the window. They had to take Joe to the vets on the first Wednesday because he had the runs, which may have been nerves because he was fine the night before, and they say he seems fine know, they just want to get some weight onto him. Joe's new owners allow all the dogs on the settee when they are around, a rule established after an earlier dog they had trashed one while they were out! However, Joe thinks he should have access to it at all times and no matter how small a space has been left uncovered he will creep into it! 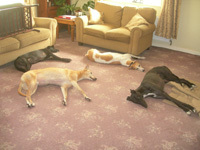 They all went for a walk with Beryl and Lucky last week, thats one happy little dog! That's nice to hear. We received a Christmas card from Joe's new owners today letting us know that he is very settled with them and gets on well with their other greyhounds, Lucy and Kelly. He's still a fussy eater no matter what they try and is loosing some of his hair at the moment. chair might be better Joe! this is half each Joe? 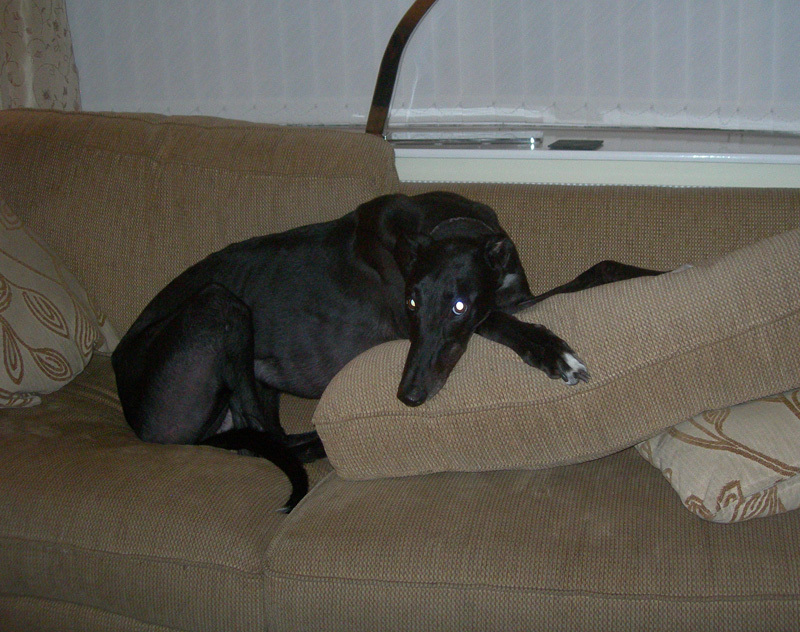 the sofa when you are out? A better position for the cushions!